Chelsea & Lincoln had a perfectly nautical wedding at Pelican’s Landing, a unique oceanfront event house in Corolla, NC! Pelican’s Landing is special in that you can rent it for partial week stays specifically to use it for your wedding! It has a yard large enough to do a tent and also includes so many “extras” like banquet tables, dishes, wedding benches, etc that you don’t have to worry about! Coastal Provisions catered the reception and handled the bartending as well. Marsha of Great Cakes! 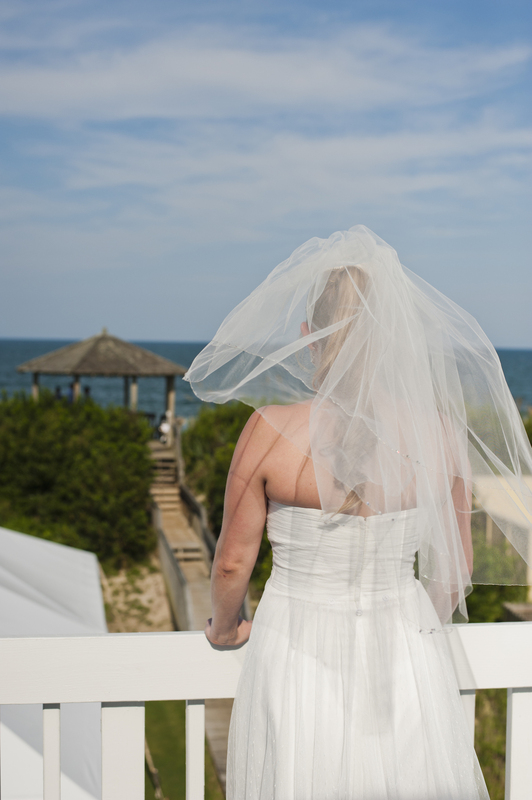 is a woman of many talents – she baked the cake and also officiated the ceremony on the beach! Rentals were through Ocean Atlantic Event Rentals and I especially loved the use of the white dance floor and the navy sequin linens on the special tables! They were beautiful! George of Coastal DJ provided the entertainment for the evening and kept everyone on the dance floor! The decor was all DIY by the bride’s family and the perfect compliment to the coastal, nautical style! Another fave from this wedding? The groom & groomsmen outfits! I love that they weren’t afraid to do something a little different and this coastal casual look was perfect for a hot August day! Enjoy the photos below by Carrie Roen Photography!